The return of SuperFogeys Origins continues! You might have missed the first page of this story (dropping new pages on holidays isn’t the best idea), but you can check it out right here. This isn’t the first time we’ve seen Spy Gal’s father. Hopefully, last week, you all took the opportunity to reread Spy Gal’s origin so you can get a better sense of her state of mind in this story, which takes place about one month later. 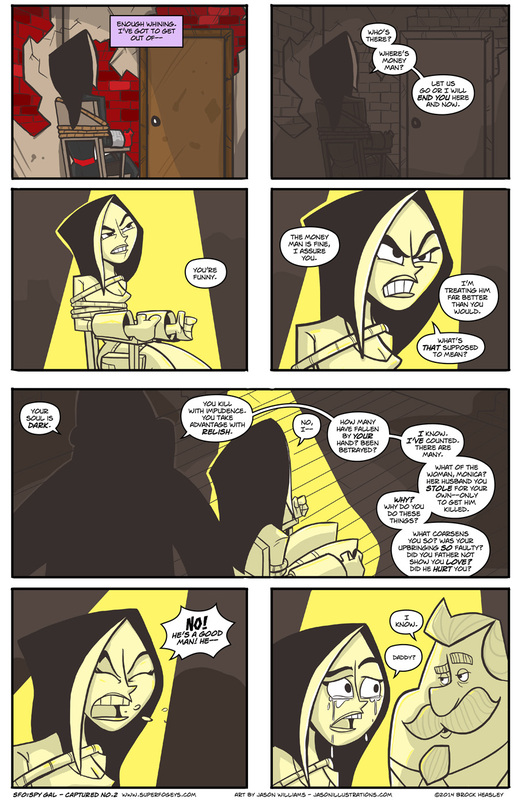 In fact, towards the end of that story you saw the last time Spy Gal saw her father before what you on this page. Not totally necessary to enjoy this story, but you’ll probably enjoy it more if you’ve seen it. The art on this page, as in this whole story, is by your cartoon hero and mine, Jason Williams! Be sure at check out more of Jason’s work at Realm of Gallimore and his artist page. Oh man, the previous page’s thoughts about good ol’ father makes now sense in very different way. Nice plotting! But it will be interesting to see where this one goes now. You have as yet the barest idea. Next page should prove enlightening. It is the eternal curse of unwanted children to suffer for the sins of absent parents. Except Vanessa’s father wasn’t absent; she ran away with Manny and Monica. Her own choice, her responsiblity. The sins are all Spygal’s. Ah, nice to see good old Jason Williams at work! His cartoony style rather kills the drama of this story, though.